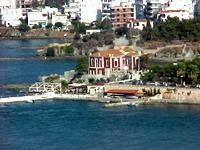 IWSSIP 2009 will be held at LUCY HOTEL, 10 Voudouri Av., 34100 Chalkida, Greece. See also: Accomodation in Chalkida and Travel info: how to get to Chalkida. The earliest recorded mention of Chalkida (also mentioned as "Halkida", "Halkis" and "Chalkis"), is in the Iliad (2.537), where it is mentioned in the same line as its rival Eretria. Chamber tombs at Trypa and Vromousa dated to the Mycenaean period were excavated by Papvasileion in 1910. In the 8th and 7th centuries BC, colonists from Chalkida founded thirty townships on the peninsula of Chalcidice, and several important cities in Sicily. Its mineral produce, metal-work, purple and pottery not only found markets among these settlements, but were distributed over the Mediterranean in the ships of Corinth and Samos. With the help of these allies, Chalkida engaged the rival league of its neighbour Eretria in the so-called Lelantine War, by which it acquired the best agricultural district of Euboea and became the chief city of the island. Early in the 6th century BC, its prosperity was broken by a disastrous war with the Athenians, who expelled the ruling aristocracy and settled a cleruchy on the site. Chalkida subsequently became a member of both the Delian Leagues. In the Hellenistic period, it gained inportance as a fortress by which the Macedonian rulers controlled central Greece. It was used by kings Antiochus III of Syria (192 BC) and Mithradates VI of Pontus (88 BC) as a base for invading Greece. Under Roman rule, Chalkida retained a measure of commercial prosperity; since the 6th century AD it again served as a fortress for the protection of central Greece against northern invaders. From 1209, it stood under Venetian control; in 1470 it passed to the Ottomans, who made it the seat of a pasha. In 1688, it was successfully held against a strong Venetian attack. The modern town received an impetus in its export trade from the establishment of railway connection with Athens and Piraeus in 1904. In the early 20th century it was composed of two parts — the old walled town towards the Euripus, called the Castro, where the Jewish and Turkish families who have remained there mostly dwell; and the more modern suburb that lies outside it, which is chiefly occupied by the Greeks. A part of the walls of the Castro and many of the houses within it were shaken down by the earthquake of 1894; part has been demolished in the widening of the Euripus. The most interesting object is the church of St Paraskeve, which was once the chief church of the Venetians; it dates from the Byzantine period, though many of its architectural features are Western. In 1899, Chalkida became the prefectural capital of Euboea. By now, Chalkida has about 60,000 inhabitants. The old walls, near the Castro of Kara-Baba (Turkish word, meaning "Black Father") near the sea no longer stand. The sizable Jewish community was reduced after the World War II deportation. The town is now connected to the mainland Greece by a new bridge in the southern and the western part.